The Texas capitol was packed as hundreds of community college students, including Richland’s Student Government Association (SGA), joined together in lobbying for the concerns of students from across Texas. Nine SGA students from Richland visited the offices of the state senators and representatives who represent Richland College’s district and surroundings areas. They spoke with elected officials directly, as well as with their staff. While students expressed their concerns on numerous issues, higher education seemingly took precedence. The main issue on their agenda was transferable college credits. As the cost of four-year college degrees increase in Texas, state leaders have encouraged students to consider a more affordable plan in their pursuit of higher education: Spending the first few years at a local community college. Many students who heeded that advice hit an exasperating roadblock however, when they transferred to a four-year school. It is not guaranteed that their course credits will transfer along with them. Richland Student Government Association delegates at the Texas capitol on Jan. 30. Edward Sesay, vice president of SGA, told legislators about his most recent encounter with a university representative. Sesay was under the impression that most of his credits would carry over to a university, but after consulting with an adviser from a four-year college, he realized that many of his credits won’t transfer. Thanh Cong Vu, SGA treasurer, echoed the same sentiments. He also wanted answers as to the way in which articulation agreements will become as useful as they are portrayed to be. “I think we need agreements that each college will take,” Vu said. Vu said he doesn’t like the fact that students are told one thing when the results are different. Kimberly Le is an SGA senator who credits the affordability of community college for her ability to pursue higher education. She told legislators about her experiences and ambitions. “My goal, like many of the students at my school, is to transfer to a four-year university. There is one major issue. Sometimes the transfer is not smooth,” Le said. After the students lodged their complaints, representatives offered solutions to the pertinent issue of transferring and the applicable college credits. Danielle Zaragoza, a Luna fellow (a Senate Hispanic research council funded fellowship and scholarship program for graduates and undergraduates), told the delegation that the office is working diligently to get to the root of the problem. They even suggested adopting the ‘2+2’ system that Florida has which guarantees that students’ 36-hour general education course completed at any public college or university will be accepted in total by any other public postsecondary institution. 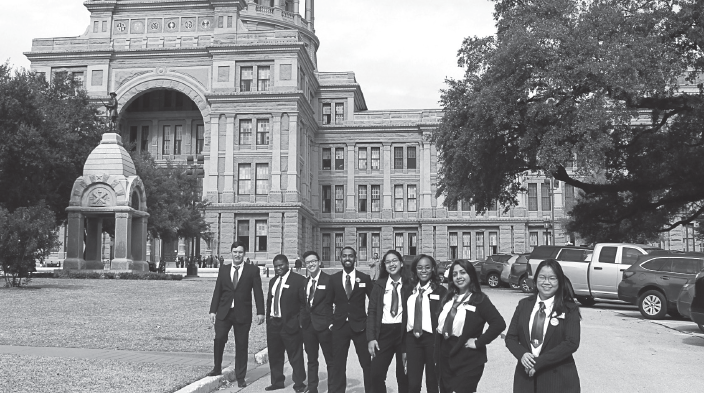 The SGA was assured that Royce West, a member of the Texas Senate representing the Dallas-based 23rd District, and his staff were tackling the issue to ensure a smoother transition from community college to a four-year institution. Students are encouraged to contact their state representatives with concerns they may have.